Channelkeeper patrols the Santa Barbara Channel on our research vessel, the R/V Channelkeeper – a 31-foot JC lobster boat, which we purchased in 2008 thanks to very generous donations from our community. Like all Waterkeeper organizations, having a presence on the water is a critical tool in our efforts to protect our waterways from pollution and habitat degradation. The R/V Channelkeeper is berthed at Marina 4 in the Santa Barbara Harbor, and we use it for a number of different on-the-water activities, including researching and monitoring the health of important marine habitats such as kelp forests and eelgrass meadows, conducting surveys in and around marine protected areas (MPAs) to assess their efficacy, investigating impacts on marine ecosystems, pioneering new methods to remove invasive algae, and monitoring potential sources of marine pollution such as cruise ships and ocean outfalls, among others. 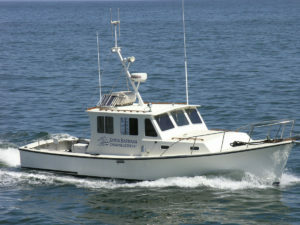 The R/V Channelkeeper is also a role model for more environmentally friendly boating practices. It was part of a cutting-edge study to test the efficacy of less toxic alternatives to traditional copper-based anti-fouling bottom paint. Boat hulls must be treated with anti-fouling paint to avoid becoming colonized with mussels, barnacles, algae and other fouling organisms, which lower fuel economy and boat performance. Traditional anti-fouling compounds, however, are formulated with high levels of copper, which is toxic to marine organisms and has heavily contaminated the water and sediment in our ports and harbors. The Channelkeeper’s hull was used to experiment with alternative paints over three years. The performance of the paints was evaluated bi-annually. One of the experimental paints, SeaHawk Smart Solutions, which uses a metal-free biocide, exceeded expectations in performance. When the study concluded in 2011, Channelkeeper decided to paint our boat hull with this more environmentally-friendly paint, which recently came onto the market. We are proud to be leading the charge for alternative, less toxic bottom paints and hope that others will follow our example.